One of the issues I struggle with when doing up the printables for these posts, is choosing which ones to do. I get so many wonderful ideas from all of you and I want, more than anything, to be able to do them all. Since I can’t do them all at once, I try to pick the ones that fit the time of year when appropriate. 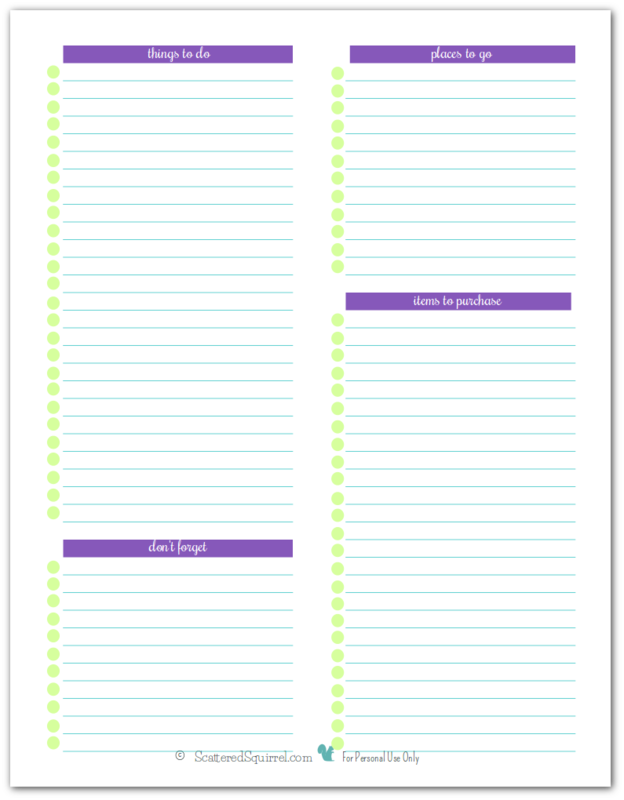 Since I haven’t quite wrapped up the Creating the Planner that Works for You series yet, I thought it might be fun to share some printables that you might want to include in your planner. When the requests for note paper and to-do lists started rolling in, I was a little surprised. Not because I was being asked about them, but because I really haven’t done too many of these. I had fun playing around with lots of different ideas and in the end, I opted to just keep them both super simple. I did opt to darken the colours a little bit. I know many of you mentioned that the lighter blue-green-purple colour scheme was printing faintly. These ones will print a little darker, and should show up much better in grey-scale printing. And of course I couldn’t forget a half-size version. As always, to download a copy for yourself simply click the images of the one you would like. Sometimes, all you need or want is just a simple page for notes. Well, look no further! 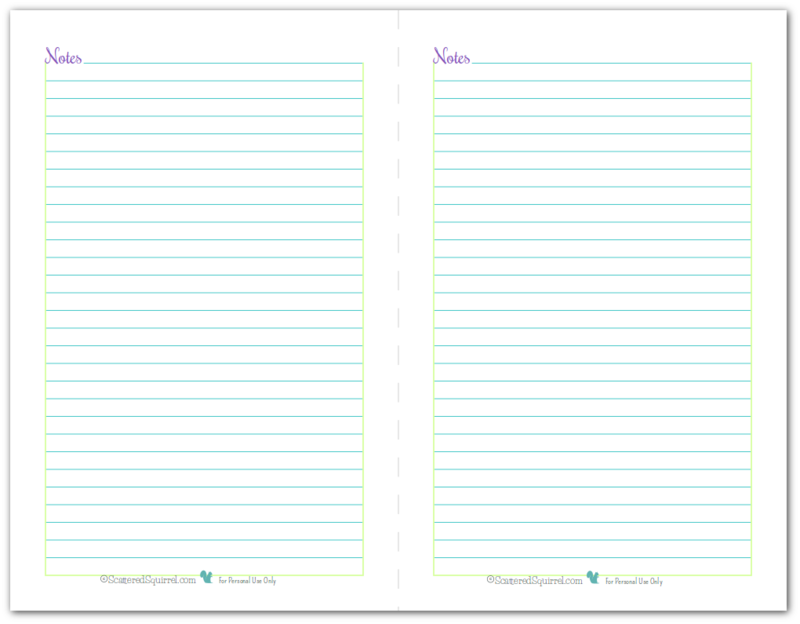 Below you’ll find both full and half-size versions of my lined note pages. Again, I darkened the colour just a bit, so they should print well in both colour and grey-scale. And again, I made sure to include a half -size version. 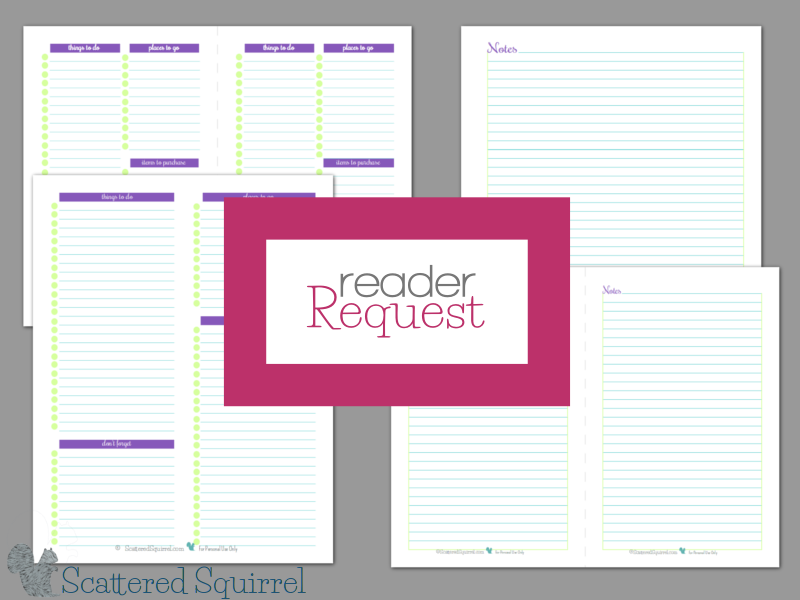 While I know they’re fairly simple printables, sometimes simple is best. I hope that you find these a welcome addition to your planner, home management binder, journal, message center or wherever else you might use them. You could print out the note pages and use a binder clip or paper clip to keep them together and store them by the phone, or other area/areas in your home where you often wish you had note paper. You could print out the to-do lists and clip them on to a clip board or use a magnet to post them on the fridge, or washi tape to attach them to a wall or other surface somewhere where you will see them and not forget about what you jotted down. There are many, many ways you could use these. Let your creative juices run free and see what pops into your head. Sometimes the best ideas come from that well of creativity that resides within us all. Do you have any creative adventures planned for this year? Do you have a favourite way of expressing your creative side? I like the “don’t forget” section! I always have things each day I need to make notes of, for future reference, but they aren’t things I got done or plan on getting done, per say, just things that need to be remembered! I am the same way Havok, I’m glad I’m not the only one. btw, I signed up for the e-course…sounds interesting! Thanks, I hope you enjoy the prinables. The e-course was kind of neat, did you enjoy it? I have to admit, I was kind of sad it was over so fast, maybe they’ll expand on it next time. Oh I’m so happy you like them. Thank you for leaving such a nice comment, I hope you continue to enjoy the site! 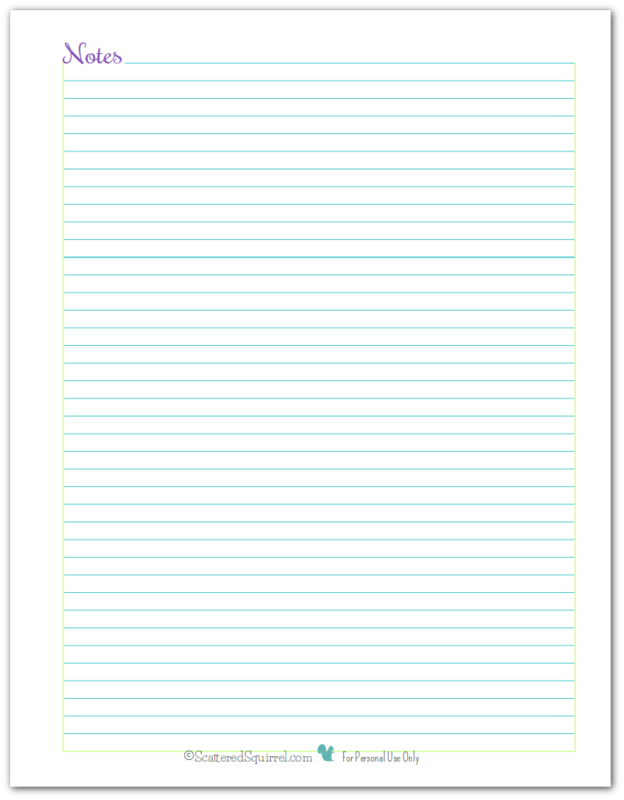 The blank, lined pages are the best and so often unavailable. I’m so glad you like the blank lined pages. 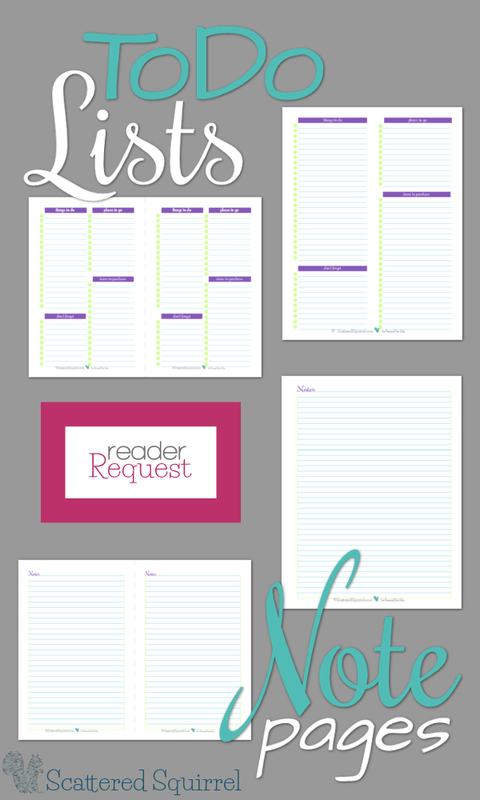 I think those of us who make printables often forget that they don’t have to be fancy, or full of checklists and labels to be useful. Your printables are only allowing me to pin them not print them. Am I missing something? Click on the picture of the printable, but not near the pin it button. It should either open the pdf in a new tab or open a dialog box so you can choose where to save it. I hope that helps. If not, feel free to send me an email with a list of the ones you would like and I can send them to you. You are my super star! It’s like this. I could make my own pages for these things, but your forms turn out so much prettier! Seriously, these are great. I will be printing them out tonight and placing them in my planner. You do a fantatsic job with your forms. Thank you! Thanks so much for your kind words David. I hope you find them helpful.